A leading Spanish museum has admitted it has lost a massive steel sculpture which weighs 38 tonnes. 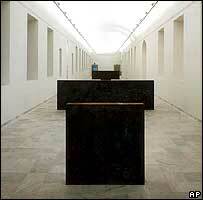 Madrid's Reina Sofia Museum bought the Richard Serra sculpture in the 1980s for more than $200,000 (£114,000). The museum says that in 1990 it put the sculpture in a warehouse belonging to a company that specialises in storing large-scale artwork. But when it sought to put the sculpture back on display a few months ago, no-one knew where to find it. The police are now investigating its disappearance. The museum, one of Madrid's largest, commissioned the sculpture by American artist Mr Serra in 1986 and acquired it a year later. The company that was supposed to be holding the sculpture - comprising four steel slabs - was dissolved in 1998, daily newspaper ABC has reported. The piece's disappearance only came to light when the museum's director Ana Martinez de Aguilar decided to put it on display again.